The Thai police’s attempt to dismantle protest camps in Bangkok has ended in violent clashes, four deaths, and over 60 people injured. Simultaneously, an anti-corruption body filed charges against the Prime Minister, which may prompt impeachment. 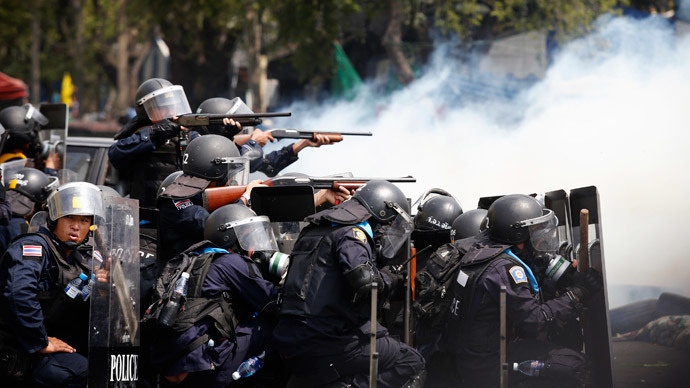 The violent stand-off between protesters and police in Bangkok was sparked on Tuesday by an operation called the "Peace for Bangkok Mission", during which 15,000 officers tried to clear protest sites around government offices in the capital. Erawan Medical Center, which monitors city hospitals, said, according to AP, that three civilians and a police officer died, and 64 others were injured in the clashes, including a journalist working for Hong Kong's Phoenix TV. Earlier in the day, the police managed to clear a protest site peacefully near the Energy Ministry, having detained 144 protesters. Violence erupted when security officers made an attempt to do the same near the prime minister's offices. Shots were fired by both protesters and police, according to witnesses. Law enforcers were eventually obliged to beat a retreat from the protest camp. Television footage and photos show clouds of tear gas above the site of the clashes. Police have denied it teargased protesters. "I can guarantee that tear gas was not used by security forces. 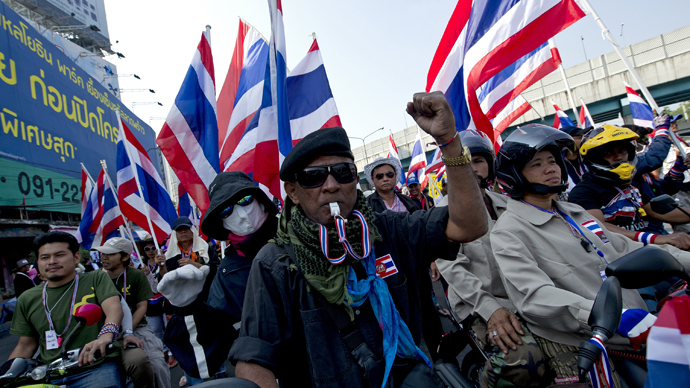 The forces did not take tear gas with them," National Security Council Chief Paradorn Pattanathabutr told Reuters. "Protesters are the ones who threw tear gas at the security forces." According to Sunai Phasuk, senior researcher on Thailand for Human Rights Watch, unidentified armed forces within the protest camp fired a military grade M-79 grenade launcher. 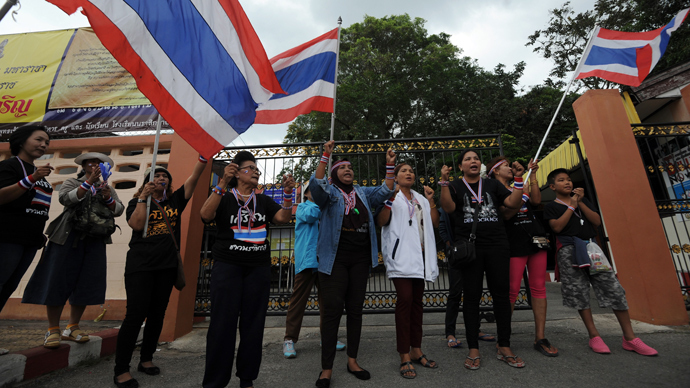 Tuesday's casualties bring to 15 the number of those killed in the sporadic Thai clashes, which were sparked when protests demanding Prime Minister Yingluck Shinawatra’s resignation started three months ago. 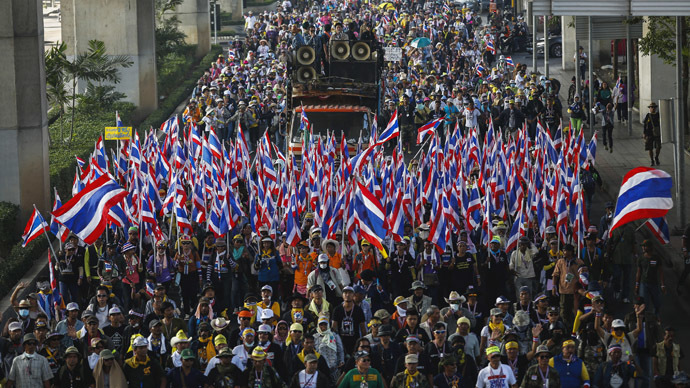 Anti-government protesters have accused Yingluck of being the proxy of her brother, Thaksin Shinawatra, an exiled tycoon and the country’s former prime minister ousted after a 2006 coup. Both sister and brother have been blamed for subverting democracy, with populist policies that buy them the support of poorer rural voters. One such policy is the rice subsidy scheme introduced in 2011, according to which the government agreed to pay farmers higher than the market price for their grain. 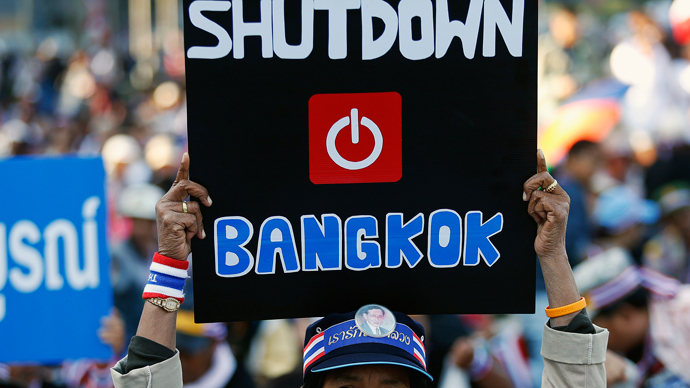 On Tuesday, Thailand’s Anti-Corruption Commission filed charges against the PM for mishandling the subsidies program. “Although she knew that many people had warned about corruption in the scheme, she still continued with it. That shows her intention to cause losses to the government, so we have unanimously agreed to charge her,” Vicha Mahakhun, a member of the commission, said in a statement, cited by Reuters. Yingluck has been summoned to face the charges on February 27. The Commission has the power to submit the case to the Senate for possible impeachment. If that happens, Yingluck will immediately be suspended from performing her official duties pending a Senate trial. Farmers have not seen any government payments for their rice for months. The banks have been reluctant to participate in the subsidy program, which has caused growing numbers of depositors to withdraw their money. Thailand's Government Savings Bank (GSB) announced on Tuesday it was calling back a 5 billion baht ($154.94 million) loan made to a state farm bank. On Monday it said it would not to extend any further loans in support of the rice subsidies program. Prime Minister Shinawatra lashed out at the banks for their stance. "It is such a shame that Thai farmers' dreams of having a better quality of life have been victimized by these political games," Yingluck said, as cited by the Wall Street Journal. "I'd like to apologize to all farmers who have been held hostage by this situation." Despite Yingluck’s promise to pay the banks back every baht lent to them, her statements failed to reassure the banks’ customers, who carried on withdrawing their deposits.